COME ENJOY A BEAUTIFUL INDOOR/OUTDOOR YOGA EXPERIENCE, COMPLETE WITH YOGA ROPE WALLS AND ALL THE PROPS YOU NEED, WHILE GAZING OUT AT THE GARDEN OF 'EATIN AND THE KO'OLAU MOUNTAINS. LEARN A SAFE, EFFECTIVE AND REWARDING STYLE OF YOGA THAT WILL STAY WITH YOU THROUGHOUT ALL STAGES OF YOUR LIFE. LEARN TO MOVE WITH INTELLIGENCE, GRACE AND EASE TO CREATE A HAPPIER LIFE! IYENGAR YOGA PROVIDES TOOLS TO HELP YOU ACHIEVE INTELLIGENCE IN EVERY ACTION BOTH ON AND OFF THE MAT. COME LEARN A PROFOUND, INTELLIGENT, REWARDING AND TRANSFORMATIVE PRACTICE OF YOGA, ESPECIALLY FOR YOU. 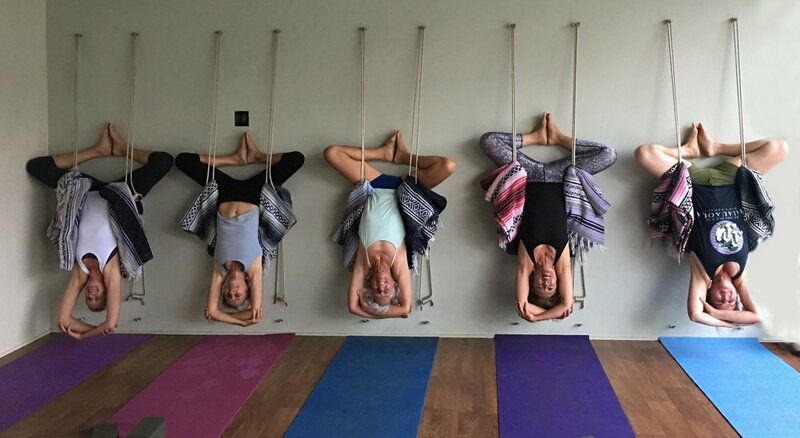 IYENGAR YOGA ALLOWS FOR EVERYONE TO REACH THEIR FULL POTENTIAL!